During the dark afternoons in fall, there will be a drawing of a bird cage, projected onto the outside wall of a tower-like building of the Felix-Nussbaum-Haus. Another bird, drawn in white lines, flies all across the outer walls of the museum, towards the cage. Other birds join in and continue to fly. But one remains in the cage. A whole flock of birds first appears, then disappears. Two more birds arrive. Together with them the caged bird flies away. The building seems to be surrounded by birds, flying around it, over it and through it. They disappear within the cracks and re-appear in other places. After a little while everything starts over again. There’s no dramatic climax, no resolution, and no happy ending in this artistic light projection, which is set in a public space. The flock of birds continuously takes its turns until it eventually dissolves in the darkness of the night. Nikola Dicke is a draftswoman. Therefore, this light installation is composed of a series of single drawings, even thought it seems to the viewer as if he was watching a film. The drawings were digitalized and put together in a sequence, so it appears to the human eye as if they were moving. They are displayed with the help of several projectors. The resulting optical effect is not only known to us through the medium of film, but has been around in children’s toys called “Wunderscheibe”, or “Thaumatrop” for centuries. These are round disks and on the front there is the image of a cage, on the other side is a bird. If you spin the disk very fast around its center axis, it seems as if the bird is sitting in the cage. The mechanical movement that the viewer creates while spinning it turns two separate images into one static image that does not exist in reality, but from our point of view, the bird is nonetheless caught in the cage. The installation “inside out” in Osnabrück is based on this idea of the “Wunderscheibe”, and the optical illusion of the captured bird it creates, but Nikola Dicke extends it through both artistic and technical media, and the choice of location. It is an invitation to the viewer to reflect upon existential topics such as movement, freedom, stagnancy and imprisonment. The animation on view consists of separate images and distinguishes itself fundamentally from other moving image projections, since the viewer can retrace every single movement of the birds and is inclined to follow them all around the museum so as to experience the entire story. Nikola Dickes’s starting materials in these projections are glass plates, blackened with soot, on which she draws her motives in small format using needles and pens. In her earlier installations, these delicate drawings were projected onto indoor or outdoor walls using rotating projectors and floodlights. That way, the miniature drawings turn into large light drawings that consume and alter an entire space. In “inside out” Nikola Dicke takes this artistic process a step further: the original scratched-in drawing is photographically documented and then a new situation of the motive in its relation to space and time evolves on the same plate. The next step is to transfer the images to an editing program, and then every image is processed again, not with hand and needle but with digital editing tools. Repeating these steps, the artist ends up with about 2000 artistic images along with the 14 original motives, which are only saved in the digital printing plate of our time, not on any solid medium such as a lithography stone or an etching plate. For the installation “inside out”, the serial character of the images becomes more important than the individual pieces, since it is about the progression of moments rather than the moment itself. Therefore, the drawings are shown in 15 different sequences of 140 to 150 images that can be projected in large scale. If the images move fast enough, the eye of the viewer perceives the scenes as a film sequence rather than as drawings. The best way to execute this idea technically is to edit the images into a video that can be projected using a strong light source. That way, moving, temporary drawings made of light can be created in public spaces. Despite the complex, serial concept and the labor-intense creation process Nikola Dicke’s drawings seem free and associative, and are executed on a fragile and elusive material. The projections are able to maintain this lightness and regardless of their large format do not seem monumental. The fact that the installation takes place on the outside walls of the museum enables the viewer to have much easier access to them, and freely associate without feeling overwhelmed by the environment of a museum. Another peculiarity about the drawings is the transparence of the line that is created by scratching out the soot and enables the viewer to still see the environment through the drawings. The projection of the works with lamps completes the cycle of their creation that has originally happened through the sooting of the glass plates with an oil lamp. The drawings do not try to cover up the environment but rather enlighten it, and therefore playfully change familiar environments to enable a new perception of them. The projections are ephemeral and, unlike a mural, do not leave traces anywhere but in the memory of the viewer. Nikola Dicke’s installations are always specific to the place they are transforming; therefore, the birds and their covey were created for this particular public space in Osnabrück: the Felix-Nussbaum-Haus. The location determines the covey. The Osnabrück-born painter Felix Nussbaum, who was killed in Auschwitz in 1944, inspired the architect of the building, Daniel Libeskind, to create something that would give his life and work a shape in which the viewer can experience all of the tragedy and disruption of the painter’s life. He created the “Museum without Exit” that enables the viewer to communicate with the works and leaves room to re-experience the thoughts and emotions of the artist. It also offers an individual projection space that Nikola Dicke is now using for her temporary installation of “inside out”. Her birds appear on different building materials, such as cement, stone and metal, thus constantly changing their color and form. They disappear and re-appear in the cracks and fragments of Libeskind’s architecture, and in their own dynamic they pass through all the architectural intersections and take their turns in perpetual cycles. Nikola Dicke’s work makes mere associations to the artistic work and life of Felix Nussbaum. It is her offer to the viewer to take a time in space to reflect about the ideas of freedom and imprisonment, protection and danger, and conditions of perception and existence. The image of the bird leaves room for imagination even in a time where allegories and symbols don’t have much value anymore, due to the overload of images in the media. You can be as free as a bird, kept in a golden cage, but safe from the cat. The installation is a work situated in public space, and visible for every museum visitor or passerby. In this way, the art returns into people’s daily routines: as free as a bird. Step right up, step right up – Nikola Dicke has directed a circus performance of exceptional magic as part of the Jerusalem Festival of Light in June 2012. Where pedestrians usually hurry past grey walls, at dusk the artist inaugurates a play with light, figures and philosophical thought. At the start of the trail through the Christian Quarter of Jerusalem, a white-clad clown is blowing colourful planets like soap bubbles into the darkness, while simultaneously including himself in one of the planetary balloons. Does that mean he is wishing himself far away? Or is he reflecting on his role on Earth? Is he dreaming? Using her very personal technique, Nikola Dicke has etched the figures into soot on glass transparencies. At night the artist projects her images onto house exteriors, creating a quite special atmosphere of contemplation. Cloaked in darkness, visitors can approach art differently than they would in daylight. Maybe they also feel more protected, perhaps less observed, allowing them to engage more freely. Five real-life acrobats, who, together with circus music, harmoniously complemented the projections for the duration of the festival, constituted an invitation to guests. This presentational unity motivated visitors to take the walking tour of the projections. At the same time the acrobats were on hand to answer questions, and to clarify the artist's intentions. The eyes bound, a fan in hand, an tightrope walker is balancing at the second stop on the trail of Nikola Dicke's ten light orchestrations. But where is this performer coming from? It remains unknown, as the rope is suspended in mid-air. Carefully, unseeing, relying only on his testing step he advances. Is he trying out something new? Is he embarking on this without a trial? Is he surrendering in full confidence to someone else's guidance? It depends on the viewer's circumstances if the scenarios awaken such thoughts. Orchestrated with a light stroke, these scenes can also simply be appreciated for their beauty, without having a deeper importance attributed to them. In her works Nikola Dicke always lets the respective location be her guide. The artist creates them for that place. And so it is that the location of the Festival gives strength to the images. Like the magician who is floating at another station in town, teasing a white dove out of his ear. His large eyes seem fearful. The two female aerial acrobats, on their swings, trying to gain momentum between walls, can be interpreted through inference to Jerusalem. They are very close, without actually touching. In an instant one of the acrobats could let go of her trapeze to form a shape with her colleague – or is she afraid to fall when she isn't being held? Nikola Dicke creates her figures and scenes with a light hand on a small canvas, on glass measuring five centimetres square. They seem as playful when projected on walls of houses, though on second view they reveal a more profound background. The drawings' charm prevents this from having a destructive effect, instead it invites quiet contemplation and examination. At one of the last stations of the trail a blue man in a cannon lets himself be shot into the night sky. Weapons are commonplace in Jerusalem. But this 'Cannon Boy' is spreading his arms like a bird spreads its wings. The man on stilts seems absurd, as he tries to swing himself with the stiff extensions of his legs onto a bicycle. He is holding an umbrella that is shining in the colours of the rainbow. Again a symbol of peace completes the picture. It is different with the contortionist – is it a man or a woman? The figure is twisting, wearing a green, red and white top. Clad in the colours of the Palestinian flag, it seems to stand securely, here in the narrow alleyways. At station eight another performer is playing with planets – he is juggling with them. This remotely calls to mind the scene in 'The Great Dictator' in which Charlie Chaplin, in that role, plays with an inflated balloon of Earth, demonstrating his power. Here the effect is almost more playful, lighter. But also more serious: the performer is holding a planet to stop it from thundering to the ground. The fire artiste surrounded by a spiral of blazing flames appears smiling, assertive, certain of victory. Is it just a symbol standing for the self-confidence of the Arab people? Or does the picture depict someone willing to defend their position with fire power? That would be a small provocation in this place, but through the art of Nikola Dicke it becomes an invitation to reflect about points of view. Nikola Dicke is essentially a draughtswoman, even if, in her art, she continually develops cross-border techniques. The conflict between light and shade is a central element of the artistic creation of the young artist. Her light-dark contrasts bear witness of a special empathy which define the artist’s view of the world. As a technique, she prefers to use materials such as charcoal or chalk with which she can create regular, diffused surfaces. However, she achieves the same result with acrylic paints, so that the limits of the technique again become blurred. For her subjects, Nikola Dicke chooses everyday as well as unusual items and, through her viewpoint, moves the depicted item into the centre of her creations. The observer thereby experiences the depicted subject afresh, through the eyes of the artist. Through the choice of detail of motif, which, in each case, only shows part of the original whole, the artist achieves an abstraction of the depicted motif which is enhanced further by her black and white shading. In the work “Entschwunden” (“Missing”), for instance, you see the pedestal and canopy of a monument, the sculpture of the monument itself is missing. The observer therefore has all the freedom and possibilities of his imagination, to imagine the sculpture or invent a story of its disappearance. In „the morning after“ (acrylics on paper), which was inspired by a trip to New York, Dicke not only shows an unusual image detail – with the hard cut of a female statute on the left and a male figure pushed into the image foreground on the right – but even tells a whole story. By way of inspiration through a few sunbeams, the motif, which originates from a group of statues in New York’s Central Park, is provided with an independent existence which pushes the statuary character into the background. The sculptures and their shadows interact with one another in a fascinating way; connected by a line of birds, they suggest a present and past relationship, the secret of which is up to each observer to detect. The works of Nikola Dicke are always characterised by the contrast between black and white, whereby she uses the black in order to make the white surfaces shine all the more. This is demonstrated in an impressive way through her technique of slide drawings, where she works on soot blackened slide glass – by way of scratch technique – which is then magnified by projection. These miniature-drawings are also always balanced in their composition and are finished in a perspectively precise manner. The subject of the bird is currently occupying Nikola Dicke in a variety of projects. „Der Vogelfänger“ (“The bird catcher”), for instance, is an installation made from plexi foil with illuminants where the suggestion of the cage – similar to slide images – develops by way of scratch technique on a dark background. In “KEIMZELLE KUNST” (“Nucleus Art”), the artist then arranges her “cages” like lanterns. In the light projection “Geflatter” (“The flutter”), birds are again in the centre of the artistic conflict, this time not moved by light. Same as in the latest glass images, in which soot blackened surfaces are transformed into fascinating water, mountain and cloud landscapes by way of negative effect and in which standing or flying birds break through the black and generate depth as well as movement on the monochrome surface. By way of this unusual combination of drawing and image projection, the artist achieves the integration of light in her work. With all her works, Nikola Dicke creates an almost enigmatic or mysterious mood which is transferred onto the observer. Through her images, we receive questions as well as answers. They provoke deep thought, evoke longings for rest and also empower to take a break from the world. Erlauben sie mir, dass ich eine kleine Vorbemerkung zur Geschichte der Kunst im öffentlichen Raum der Stadt Bremen mache. Es ist heute aus dem allgemeinen Bewusstsein verschwunden, dass Bremen Anfang der 1980er Jahre eine Vorreiterrolle im Bereich der Kunst im öffentlichen Raum - insbesondere von künstlerischen Wand- und Fassadengestaltungen - gespielt hat. Und Bremens Fassadenkunst der 1980er Jahre (einiges sieht man davon an Bremens Häuserwänden auch heute noch) war damals für andere Städte dieser Größenordnung in Deutschland völliges Neuland. Bremens künstlerische Fassaden- und Wandmalereiprojekte waren ein großes Vorbild für Kunst-im-öffentlichen-Raum-Projekte nicht nur meiner Heimatstadt Osnabrück, wo man das Bremer Modell viel diskutiert und schließlich auch imitiert hat. Auch viele andere Städte in der Bundesrepublik übernahmen das Bremer Modell, wobei Künstler nach dem Vorbild Bremens öffentliche Aufträge erhielten und viele auch von ihrer Kunst leben konnten. Hinzu kam, dass der Schritt der Kunst hinaus aus den Museen und Galerien auf die Realität der Straßen, wie er in Bremen so vorbildhaft erprobt wurde, zwar nicht etwas absolut Neues, aber doch etwas Bahnbrechendes und Aufsehen erregendes an sich hatte. Ich habe auf diesen geschichtlichen Aspekt in Bremens Kunstgeschichte deshalb hingewiesen, weil ich finde, dass Nikola Dicke mit ihrem Lichtkunstprojekt - wenngleich mit anderen Mitteln - an diese eindrucksvolle Bremer Kunsttradition anschließt. Ich selbst staune immer wieder, wie Nikola Dicke das eigentlich alles schafft, derart schwierige und von der Recherche und der Logistik her außerordentlich komplexe und monumentale Lichtkunstprojekte - heute in Osnabrück, dann wieder in Köln oder Stuttgart und jetzt im Stephaniviertel in Bremen - zu inszenieren. Hier im Stephaniviertel sind es alleine acht Stationen, die entstanden sind und die sich thematisch mit der Historie dieses Viertels, aber auch mit ihren Geschichten und Mythen rund um das Stephaniviertel und das Faulenquartier auseinandersetzen. Was ist der Gewinn durch eine solche Kunst? Man könnte sagen, sie bereichert uns und führt uns aus dem täglichen Allerlei heraus. Aber diese Kunstaktion war zumindest für viele Bewohner dieses Viertels nicht nur eine sinnliche oder ästhetische Erfahrung, sondern sie war mehr, weil viele Bürger in die Prozesse, die zur Realisierung führten, involviert waren und mithalfen. Insofern war es sicher auch ein interessantes Gemeinschaftserlebnis und neue positive Erfahrung im Miteinander für alle Teilnehmenden, eine solche Aktion gemeinsam bewerkstelligt zu haben. Und es ging ja schließlich auch darum, unsere Augen für die Besonderheiten und für die urbanen und geschichtlichen Aspekte eines Ortes, an dem man arbeitet oder wohnt, zu öffnen. Aber wie geht das eigentlich? Wie funktioniert so eine Technik, mit der man so monumentale Bilder an die Wände werfen kann? Diese Frage hört Nikola Dicke sehr oft. Kurz gesagt - das geschieht einfacher, als man es sich vorstellt. 2003 hat Nikola Dicke "eine alte Kindergartentechnik" - wie sie es nennt - für ihre Kunst entdeckt. (...) So entstehen auf dem Dia winzige Miniaturzeichnungen, die dann per Projektor monumental auf Häuserfassaden projiziert werden können. Mit dieser verblüffend einfachen Methode bewirkt Nikola Dicke ein faszinierendes Kunsterlebnis. Und das Besondere daran ist, dass dieses Kunsterlebnis den Blick auf alltägliche Situationen, die wir eigentlich allzu oft nur beiläufig wahrnehmen, schlagartig verändert. Denn der Künstlerin geht es ja nicht nur darum, einen Straßenzug oder ein Stadtviertel oder eine Architektur durch Kunst aufzuwerten. Sondern es geht ihr besonders darum, unser Bewusstsein für die Eigenart eines Ortes zu schärfen. Ausgehend von einer Einladung der Kulturkirche St. Stephani durch Pastor Achim Kunze, hat Nikola Dicke bereits seit letztem Sommer an der Idee einer größeren Kunstaktion im Stephaniviertel gearbeitet. Dass sich Bürger des Faulenquartiers, darunter Gewerbetreibende, eine Kaffeerösterei beispielsweise und ein Cafebetreiber - als Standortgemeinschaft zusammengetan haben, um dieses historische Stadtviertel auch über kulturelle Veranstaltungen aufzuwerten, kam ihr entgegen und hat viele Türen geöffnet. Nikola Dicke hat sich in die Geschichte des Viertels eingearbeitet. Sie hat sich mit volkstümlichen Überlieferungen und mit Legenden und Mythen rund um dieses Stadtviertel beschäftigt und darauf schließlich in ihrer Kunst Bezug genommen. Tatsächlich allerdings bezieht sich der Name "Faulenstraße" auf einen historischen Begriff: So bezeichnete man im Mittelalter eine schmutzige und ungepflasterte Straße als "Faulenstraße". Ergänzend ist noch zu sagen, dass die Faulenstraße für Bremen lange eine ganz wichtige Verbindungstraße für Transporte vom und zum Hafen war, denn bis vor den zweiten Weltkrieg führte die Faulenstraße direkt via Hafenstraße zum Überseehafen. Um die einzelnen Standorte für ihre Lichtkunst festzulegen, hat Nikola Dicke Hauswände und Orte inspiziert, hat mit Hausmeistern, Handwerkern, Geschäftsinhabern, Unternehmern, Hausbesitzern oder Mietern von Wohnungen gesprochen und neben den vielen zu klärenden Fragen - beispielsweise, wem gehört diese Hauswand, die ich bespielen will und woher bekomme ich die Genehmigung, oder woher bekomme ich den Strom für meine Projektoren - die Menschen im Viertel in vielen Einzelgesprächen für ihr Vorhaben interessiert. Und dabei ist sie überall auf Interesse und offene Ohren gestoßen und hat zum Beispiel ihre Technik nicht nur in Büros, sondern auch in Abstellkammern und Wohnzimmern und sogar in Schlafzimmern der Häuser um die Faulenstraße aufbauen können, um die Projektion in die richtige Richtung bringen zu können. Viele haben bei der Verwirklichung und bei den großen und kleinen Problemlösungen geholfen. Insofern ist aus der engen Zusammenarbeit von Künstlerin, Veranstalter und von Menschen, die in diesem Stadtteil wohnen oder arbeiten, ein Gemeinschaftswerk geworden, das vielleicht zur noch stärkeren Verbindung und Identifikation mit diesem in vielerlei Hinsicht interessanten Bremer Stadtviertel beiträgt. Vielleicht haben sich ja auch einige Menschen, die hier leben und arbeiten, überhaupt erstmals mit der Geschichte und den Geschichten dieses Viertels befasst. Ich kann mich nur dem Dank an alle, die zur Realisierung beigetragen haben, anschließen und wünsche Ihnen einen interessanten Rundgang. When we were young we were fascinated by the kaleidoscope. Turning it, the ever-changing dance of luminous spots and clusters of colours testified over and again that it is not an optical but a magic instrument, a transformer of the world. It never lost its power, at all times presented new figures and ideas. Because of the clever interior construction of mirror strips and coloured chips it amazed us at each movement with graceful reflexes, flashing lights and overwhelming colour patterns. An echo chamber of light in a bewitching infinite loop. A jewel could not be more beautiful, none could sparkle and glitter more animatedly. Nikola Dicke has rightly called her expansive kinetic light installation “kaleidoscope“, for the arrangement of the elements, the exploitation of the optical principles and, the key effect, the rotation of innumerable mirror chips produce the same visual storm. Projectors placed high up on the walls send their light beams from steep angles onto a large number of discs arranged as an ensemble on the ground. These are covered with mirror shards and keep rotating. So the incident and emergent angles of the light rays change continually. In this way, like brightest ivy shimmering permanently, an infinite stream of layers of all kinds of shapes, silhouettes and refractions entwines and chases over the walls of the hall. Each moment seems to be born right now, fresh and new. The projectors contain slides with graphically scraped off soot layers that add a modulating, animated tone to the plain light beams. The onlookers experience a mixture of amazement and immersion when they become part of the kaleidoscope. Turning their eyes here and there they find themselves in the centre of the light phenomena, in an optical exuberance that simultaneously rushes by and hits them so that they feel all the promises of a big adventure of looking and watching. Everything is simultaneously ambassador of itself and something else. Form, content and technology of the presentation inseparately lay the groundwork and create a brilliant superlative of perception and of the optical, sensuous stimulus. Looking at and looking through, frame and pictorial space, fore- and background, effect and impression overcome their boundaries and create a suggestive pictorial space that, in its title, justly refers to the mythical-metamorphic magic powers and the thrilling visual magic of the children's gadget. The well-known poem by Matthias Claudius formed the guideline of the artist's light drawing that was shown for about a week at “Christuskirche“ in Cologne in January 2010. Its bell tower picked up the motif of the “gold'nen Sternlein“ [“golden starlets“] falling into a girl's little shirt. The fairy tale “The Star-Money“2 is about a girl that gives away everything she possesses. Finally, however, she receives a new shirt into which the stars rain down as gold Talers. The tale “The Star-Money“ ends happily: Told in the darkness of an evening the story is meant to console and enrich, in a “quiet chamber“ you are to forget “the daytime's trouble“. But this is only one aspect of twilight. Much more frequently we experience it as a menace, as the time that creates devils and daemons, which is a primal human experience. In the Middle Ages people reacted by equipping the west facades of churches with patron saints, dragon slayers or complete legions of saints, because the west, the night side, is the direction that daemons come from. On the west facade of “Christuskirche“ the girl from “The Star-Money“ appears again, running through heaps of bones in her shirt and with bandaged eyes – at first sight a shocking motif. Is she running away from her daemons or straight into them. Not being able to see is terrible enough in itself. In his poem Matthias Claudius presents blindness, the lack of perception, as the cause of our wrong, superficial or inaccurate reactions. And so the west facade of “Christuskirche“ offers protection against the daemons, too, for the bone-pattern-motif is a quotation that may be found quite near in the “Golden Chamber“ of “St Ursula's Basilica“ in the city centre of Cologne where bones have been collected and venerated as relics, i.e. the mortal remains of patron saints. Most of the drawings around the church are conflicting and ambiguous. They allow for different interpretations and endings, just like the story of “Christuskirche“ itself. It is only in the fairy tale that the ending is definitely a happy one. Nikola Dicke has always drawn and that long before studying at the Academy of Fine Arts Muenster. But with her art professors Ludmilla von Arseniew (whose master student Nikola Dicke became in 2004) and Michael van Ofen she develops and sharpens her visual strategies. Both von Arseniew and van Ofen are concerned with landscape topics and, in addition, both attempt to trace the phenomenological effectivity of light in the motifs of their pictures. The preoccupation with light and shadow has finally become a central element of Nikola Dicke's artistic process, too. The artist's oeuvre contains numerous travel pictures. The Italian harbour of Genoa has captivated the artist for a long time and, in addition, the city of Jerusalem that is so strangely stacked into Israel's hilly countryside. She painted in Lofoten, in the Norwegian Sea, until she was unable to recognize anything after dusk. It is typical of her never to use pencils for her drawings but instruments with which you can produce evenly black surfaces. She sometimes takes photos of her motifs to use them as a basis for her drawings. In her paintings and her mainly small drawings Nikola Dicke modifies her motifs to a point of abstraction where they appear unreal, remote and enigmatic. It is not only the black and white presentation but also the details that look like being zoomed in which disturb the familiarity the same motifs would create by daylight – a detail of a building or a street scene, for instance. As a result of the artistic questioning of phenomena in the twilight between day and night these small artistic shifts of context abruptly change our views of familiar things. Objects, forms and structures suddenly acquire a portentous, enigmatic and mysterious flair. The remarkable thing about this phenomenon is that in Nikola Dicke's pictures something unexpected emerges that does not appear directly but is experienced atmospherically. Something you perceive but do not see. Nikola Dicke's pictures raise questions that keep us preoccupied without giving us certainty. Some details, always concerned with the transition from light to darkness of from darkness to light, make instantly think of crime scene photos. The effect of these pictures is ambivalent; they create a fascinating experience of art, above all since the viewer may perceive the pictures as “exclusively“ aesthetical abstract compositions, but, just as well, in a different way as they may also evoke feelings of danger, menace and perturbation. Moreover, these pictures have connotations of dream moments or visual recollections ascending from the deepest layers of our consciousness. The artist's pictures demonstrate the absurdity of the unambiguous readability of things. Simultaneously with her drawings Nikola Dicke presents light projections at the “Stadtgalerie” in a wider syntax of spatial aesthetics. In 2003 she discovered “an old nursery school technique”, as she calls it, for her artistic work. This both simple and astonishing method gives the artist the opportunity to adapt her subject matter by simple means to the medium of light art and wall-filling dimensions indoors and outdoors. Nikola Dicke's artistic work is in a long tradition of painting and graphic art, starting with the early night paintings from the end of the 15th century and brought close to Modern Art with the chiaroscuro paintings of the old Italian and Dutch masters like Caravaggio and Rembrandt or the night visions of Francisco de Goya. In Contemporary Art such traces may be found in the visions of the night pictures of the American Edward Hopper. 1. The quotations in italics are taken from an interview between Nikola Dicke and André Lindhorst in March 2009. BLACKNESS produced by light. dirt by incineration, lamp black on glass. unpredictable structure of overlapping layers. drawings scraped, scratched, wiped out of darkness. sunlight casts the drawing on the wall. a projector shows the picture of the picture of the image and has its light play with structure, drawing and blackness. the movements of the flame, which have been captured in the texture, interact. materially, the light refracted by sooty particles is located in the black sections and, at the same time, immaterially, in the transparent glass. the omitted details, the eliminated shapes, are the sunlight on the figure that is portrayed. a negative positive or a positive negative? light oscillates in the flaying edges, in the sepia tones of semi-transparent layers. sooted-over surfaces overlap and turn into a three-dimensional figure. projected and magnified by means of a slide projector a room is created that you can enter, a silhouette yourself, in and out of focus at the same time, completely immersed in your own oblivion. viewed from the other side, the blue-grey light of a rainy day shines through the glass picture. the soot picture is transformed into a window painting. sacred in form and secular with regard to the presentation of the statues of the saints. LITANY of the saints, the name expresses it beautifully: all the saints are invoked. you can make a lot out of a lot. for your own safety, it won't do any harm. the ritual of the ever-invariable, ever-repeated elements of the antiphonal litany denotes meditation, stepping out of profane reality, an enraptured, more profound and, at the same time, detached view of our world. the saint made of stone looks floodlit and bothered, at the wayside, on the bridge, at the city gate. in Nikola Dicke's drawings we are given the opportunity to view, in a new and reflective way, the saints that can look far into time and to discover them, completely part of this world, to be light itself. Bathed in diffuse twilight that blurs the sharp contours and sometimes even seems to dissolve them, architectural light structures of transient beauty rise on the walls. Similar to ephemeral constructs their suggestive charm lies in the need for observation from a distance. Too close an approach conceals the detail, hides parts of the structure and makes the immaterial rooms disappear. And finally a blackout may abruptly dissipate the delicately chased architectural structures into darkness or even extinguish them completely. In her work Nikola Dicke falls for the temporary charm of light that she does not, however, make perceptible physically or materially but uses it, as it were, like a drawing tool to reproduce her immediate surroundings in the transitory presence of the chosen medium. Inspired by the genius loci she scratches the set-pieces of the architectural or urban surroundings that she perceives into sooted glass panes. Created in small format but presented in large format, rooms, buildings and streets are turned via projection into giant light drawings that make the viewer perceive space and time in quite a peculiar manner. What in reality is planned as being permanent reveals its transitoriness in a graphic reproduction that may be annihilated abruptly. Architecture as the point of departure is converted into a medium that, paradoxically, because of its immaterial character, turns out to be less modifiable and changeable than constructed reality. The graphic reproduction on the sooted glass can impossibly be corrected since the drawing pen destroys the priming and prevents any changes. Each stroke possesses a binding character, becomes unremovable, defies any revision. Projected onto the plane wall as a transparent light drawing the seemingly three-dimensional building turns out to be an enchanting, quasi fairylike chimaera that – like a mirage – dissolves the more you try to comply with its inviting gesture to enter it. The impressions gained on site – in the present exhibition the garden front of “Romberger Hof”, the modern sculpture in the inner courtyard, the neighbouring church and bank – become pictures of a magic lantern that, to the passing observer, fuse into a transparent reproduction of the complex urban surroundings. The real sources of light in the exterior area partly compete with and partly complement the bright pictures on the walls. While the erratically flickering abundance of light caused by vehicles, traffic lights and neon signs contrasts sharply with the harmonious, nearly contemplative light pictures, it establishes, on the other hand, connections between the architecture proper and the outlines of the buildings drawn in light. The “Twilight”, i.e. light supplied by two different sources, illuminates a scenery in which the urban surroundings fragmentarily light up the exhibition space of the portrayed buildings where model and copy, original and reproduction meet in the unifying medium of light. Nikola Dicke's light installation in the former synagogue of Drensteinfurt consists of a projection of moving stills. There are, for a start, two slides […] in small format, the 'software' as it were. In addition there is some equipment, projectors and somewhat bulky reflection surfaces covered with mirror film that are turned by motors, the 'hardware'. The room itself, including furniture, equipment and all those present, becomes part of the projection screen. As a consequence visitors are in the midst and part of the picture. What you can see are two projectors and, in somewhat dusty air, their projection rays, the slowly turning reflectors and projections on the floor and on the walls distorting the picture; on the one hand a static slide picture on the ground, on the other hand streaky accidental lights moving slowly through the room fathoming its depths and shallows. Distorting each other through changing incidence angles they suggest a kind of swinging underwater world, evoke polar light effects or nebulae wandering through space. The effect is a strongly modified perception of the room. Dimensions start shifting along with mood and atmosphere. The room is felt to widen indefinitely and to be compressed at the same time. A formerly sacred room regains its sacrality. The result is a sacred room within a sacred room. Sacred rooms probably never completely lose their sacrality which always remains present somehow, but with the help of this and other events that have taken place here it is intensified and becomes more clearly perceptible. All this, however, is an illusion, you do not see any accidental lights. What you do see are pieces of wall or floor or skirting or window bar or chair leg or door frame, whichever is being illuminated. By foisting these different levels of perception, which mix and interfere with each other, on the viewers she makes a farce of their perception. She toys with what they see and do not see, with what they see or believe to see. Reality is distorted through the projected image and, vice versa, the projected image is distorted by reality. A reciprocal effect that well reflects world-view and viewing the world in general. Light or the play of light traditionally play an important role in furnishing the interior of sacred rooms. Is there anything more impressive in a cathedral than the superb - figurative or decorative - coloured windows? Depending on the incidence angle of the sunlight they fill the room with colour or can be found as projections inside the church building. What else are church windows but huge lantern slides? Or else you may think of the billowing light of hundreds of candles mystically charging Evensong. Such mysticism can naturally be felt in Nikola Dicke's “light-show”, too. There is a wide range of contrary positions between which Nikola Dicke builds up a field of tension. The title of the exhibition is “endless story” which, definitely, refers to its proper visual content. The most striking aspect of this installation apparently is rotation, the gyrating succession that ever and again repeats itself suspending beginning and end. This slowly recurring, never-ending succession of events makes time clearly perceptible. In this case slowness in particular becomes an elementary quality of perception. Endless and timeless. We thus approach the concept of eternity and are deeply involved in sacred thoughts. There is an element of time at the bottom of all rotary motion which is physically defined by revolutions per second, per minute, per hour, i.e. per time unit, the notion of time apparently linking religious and secular thinking anyway. With her installation Nikola Dicke has perfectly established this link. Although Nikola Dicke presents slide projections she does not describe herself as a photographer but as a graphic artist, for she projects drawings instead of photos, which means she works manually, starting with her own miniatures. […] Like some ephemeral, insubstantial graffiti the light leaves its trace on the walls turning static surfaces into three-dimensional entities full of movement and atmosphere. Rotating, rolling, shining lines are the result of her graphic reduction and thus of a material absence that makes the phenomenon of transparency the subject of consideration. The artist is not concerned with making light itself physically or materially visible (as is often done with light rooms in so-called “Light Art”) but with using light as a kind of pen, thus creating in small format but presenting in large size. Nikola Dicke uses light to create three-dimensional spaces that are filled with a particular, sometimes even idiosyncratic structure of signs. She moulds the light with these signs creating a substance that light itself does not actually have, since it is indeed - as electro-magnetic radiation – an optical phenomenon. Light, however, does possess enormous power since it is essential to visualise things. The appearance of objects is bound to the appearance of light. Light is always present, be it point-shaped at night as stars in the sky, filtered diffusely through fog, or gleaming in bright sunlight. Light may be understood as the origin of being and is, accordingly, in pagan as well as Christian cultures and traditions, identified as that which is or that which creates. Plato's Parable of the Cave illustrates that light and truth correlate, as for him knowledge means recognizing how the phenomena represent the truth lying behind them. The terms appearance, enlightenment, illumination or radiance reveal the significance of light for perception, creation and myth. According to Christian doctrine light is identified with the divine and, consequently, a Gothic cathedral is the perfect illustration of the metaphorical meaning of light, for here, in this first instance of light art, light is a depiction of God and the universe. Nikola Dicke uses this medium to outline her own references to light and, simultaneously, to leave space for association. For the exhibition at Kunstraum 28/30 she has projected drawings that are additionally concerned with the topic of light. She illuminates indoor and outdoor walls and makes them, as it were, appear in a different light, exceeding, however, a merely decorative, ornamental level, dealing with existential sources of light that lead out of danger and, additionally, with the romantic glow at night. The title of the exhibition, “Laterne, Laterne”, instantly evokes a well-known nursery rhyme, not only referring to the season but also establishing a parallel with the motifs of the illuminated pictures on the - handmade - lantern. Together with sun, moon and stars the lantern lights the way in the dark and, at the same time, lights the drawings on the lantern. Nikola Dicke has, for this exhibition, designed some lanterns with motifs that can also be found in the light installations at [Koeln-] Bayenthal. There is, for instance, a “Harbour Lantern” that, illuminated, may be carried as such through the streets, but the wall projections partly refer to harbour scenes as well. In the courtyard of Goldsteinstrasse 94 there is a projection called “Storm in the Shrouds” - you may associate icy whistling winds, cold pounding rain, clanking masts, roaring waves and stormy clouds in the middle of which a sailor is climbing in the shrouds, i.e. the wire rigging that is to keep the masts securely in position. The maritime topic is continued on the wall of a house in Koblenzer Strasse where your can see the lighthouse of Genoa, a seemark visible from great distances, which, with its light signals, guides ships through storms, dangers and shallows, makes it possible to navigate and escorts safely to the destination. And so the work is called “In the harbour (of Genoa)”. The light drawing shows a quay, a safe landing place that protects against severe weather and danger. In her wall work “Hoch auf Deinem Throne” [High up on Your Throne] in Goldsteinstrasse 45 the artist deals with the lyrics of the so-called Paderborn Pilgrims' Song, entitled “Meerstern, ich dich grü:sse” [Hail, Star of the Sea]. The refrain is, “Maria hilf uns allen aus dieser tiefen Not” [Mary, help us all in this deep affliction] and the light that is invoked is to be understood metaphorically. It is the Christian revelation in light that inspires those who recognize the truth and Mary is the mediator who can save from all misery. Nikola Dicke has projected a grotto of the Virgin Mary onto the narrow, towering exterior wall. The Mother of God is presented seated with her child, above her you can see a kind of protective canopy. 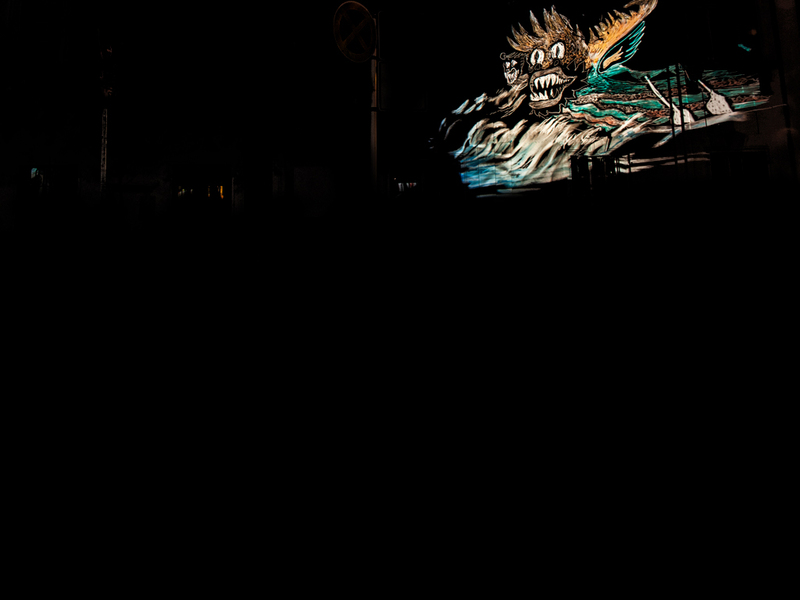 A bit further down Goltsteinstrasse, on the left, there are two towering brickwalls at right angles where the artist has installed alternating light drawings that are connected with a - or rather the – romantic night motif: the farewell scene between Romeo and Juliet which the artist calls, “It was the nightingale.” In Shakespeare's portrayal of reality it was not the nightingale, of course, and the beginning twilight does mean the break of a new day even though Juliet claims the opposite; the veiling protection of the night is exhausted and so their hiding place is lost. For the lovers the appearance of light means separation and even banishment. With the help of some simple and masterly graphic devices Nikola Dicke succeeds in making expressive statements, gaining and focusing our attention despite the omnipresence of flickering pictures in the media and shining advertisements in our cities. Nikola Dicke, a student of Ludmilla von Arseniew's at the Academy of Fine Arts Muenster, was nominated a Master Student in 2004. I got to know and learnt to appreciate her artistic work on the occasion of a number of exhibitions. Nikola Dicke belongs to a group of young artists, both male and female, who boldly link up painting and drawing. Her work on paper – less frequently on canvas - is mainly in small format and plays with the borderline between painting and drawing that she considers to be questionable, the borderline between linear self-expression and the possibilities of a composition of surfaces that stimulates coloured perception. The sketchiness of a line and its dissolution by her paintlike manner of applying the brush that at best marks a “both … and“ reflects, as it were, the ambiguity of the pictorial symbols that regularly elude concrete definition. At first sight natural objects, a landscape, turn into coloured signs. The achromatic range of pictures – a blue that is broken in subtle nuances, earthy shades of brown, black, grey and, time and again, white that also, as the colour of the paper, is left unchanged – in combination with a biomorphic, smoothly dissolving set of shapes evoke associations of a landscape: We catch sight of rock formations or take a bird's eye view of a sparsely vegetated coastline, spot a lake shimmering coolly between barren hills, climb up mountain ranges or overlook some snow-clad countryside under a grey and dull sky.The iridescent light that again and again directs our view to the horizon makes us think of dawn or dusk when light and shadow interweave undecidedly. But Nikola Dicke's works refuse access to all kinds of “reading instrumentalisation”. They enforce a perception that is not meant to recognise but an actually perceptive perception that accepts as true the dialogical openness of pictorial composition and symbol, the mere “as if” of all kinds of objective interpretation. They thus crystallise an almost meditative aura in which seemingly simple and familiar elements provoke a new way of seeing and understanding. The small format possesses great inner strength and the forms that look like being succinctly jotted down with brush or pen own just as much associative density betraying convincing compositional acumen. Nikola Dicke's drawings and paintings are strangely unspectacular and yet exhibit a disarming, quiet poetic power, for instance in the mysterious play of light that less illuminates the objects than makes them shine. Her simple and at the same time lavish design is impressive. It is fed by the tension between directness and reflection, action and recollection, spontaneous notation and highly deliberate investigation; she does not get lost in details but prescinds in favour of the “big” form – so that the expanse of a scenic prospect may be detected in small formats as well, and, through the choice of detail, give it both closeness and intimacy.